Looking for a unique gift? Here is your chance to support fair trade and the sewing co-op in our Sister City Carasque, El Salvador. We offer beautifully sewn, embroidered and crocheted items – lovingly made by members of the Carasque Co-op. Read more about the Co-op below. Popular items include childrens’ T-shirts, 6- and 12-month onesies, pot holders, tote bags, bread wraps, napkins, and more. Here’s a more complete list of what we sell. Items and styles change frequently, so check back. PICA sells items from Carasque at Maine fairs and other events. You can also contact us at info@pica.ws or 945-0020. Be sure to leave your name and phone number or email address so that we can get back to you to arrange a personal shopping session with one of our PICA members. 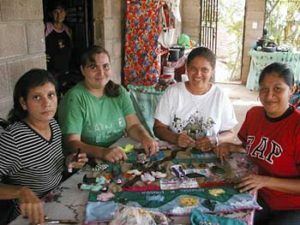 In the mountain village of Carasque, El Salvador, women, girls and men gather to sew, embroider and crochet. Large items like the crocheted hammocks are created cooperatively. Members of the cooperative express their individual creative spirits in their colorful designs. These imaginative designs include the colorful flowers, birds, animals and trees in their rural surroundings as well as global imagery. A popular pattern for tote bags, aprons, and T-shirts is children holding hands around the earth. 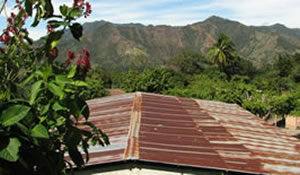 For 12 long years, the people of Carasque struggled through a civil war. They fled their village to escape death but returned while the war still raged to rebuild their community, demonstrating great courage and collective determination. PICA began our Sister City project during this time, as an effort to help protect the human rights Carasque residents and other repopulated villages. Now that peace has come, sistering continues to be an extraordinary path of learning and mutual support for both of our communities: Bangor and Carasque. Over the years, delegations of women, teachers, healthcare workers, small farmers, and people concerned about the impact of free trade have visited Carasque. They have come back inspired by the power of real community and with a desire to work together in Carasque-an fashion, seeking solutions to problems that affect us all. Our support for Carasque’s sewing co-op is an expression of our commitment to sistering. The cooperative includes nearly fifty people crocheting, sewing and embroidering. They run the co-op democratically, make big decisions collectively and divide their profits among the members. Sales of their work provide one of the few sources of income to this village of about 350 people, other than remittances sent home by relatives who have emigrated to the United States.